California STAR tests are scheduled to be held on April 30-May 9. We need your help to organize snacks for the students on Monday, April 29 at 8:30 in Room 8. Please contact Evangeline Ireland at emireland@yahoo.com to get involved. Yearbooks may be ordered at www.jostens.com or through the school office. They are $40 each. The PTSA will hold its next meeting on Tuesday, May 14, to close out the year and elect a new executive board. Band families will meet beforehand to elect new leadership. 8th grade parents will meet afterwards to finalize end-of-year activities. A June 2 groundbreaking is planned for the construction of the new Portola at the site of the closed Castro elementary school. Time to be announced. Congratulations to the winners of the Earth Day clean-up competition. Saturday June 1 from 4:00 pm-7:00 pm. Wine and Cheese in a fabulous garden in Kensington. Enjoy wines perfectly paired with cheese. Don’t worry guys! They will also be serving beers and cheddars. The cost is $20 per person. Don’t miss the social event of the season! Spring Faire is scheduled for 11am – 3 pm on Saturday, April 20, and features games, crafts, food, music and other fun carnival-type activities. We need your help to organize the event and also to volunteer on the day of the Spring Faire– please contact Sally Foster-Wagner at ksalkev@aol.com. Or click on the VolunteerSpot button to sign up! Portola’s garden planters are in dire need of some TLC. With very little rain this winter, the plants are not doing well. If you are available to come once a week to give some love to these plants, the students and teachers would greatly appreciate it. Hoping more than one person volunteers for the Garden Crew so that you can rotate weeks –if there are enough volunteers, then you only have to come once a month. Please contact Evangeline at emireland@yahoo.com if you would be willing to be part of the Garden Crew. Students are invited to join the Portola Track Team. Meet on Mondays and Thursdays at 2:35 p.m. in Ms. Baldwin’s room. California STAR tests are scheduled to be held on April 30-May 9. We need your help to organize snacks for the students on Monday, April 29. Please contact Evangeline Ireland at emireland@yahoo.com to get involved. Help is needed for supervision while students are changing clothes for PE. Volunteers are needed to supervise students who have already finished dressing and gone outside, so that the teacher can be free to supervise inside the locker room. The need for help is greatest between 12:30 p.m.-12:50 p.m. and 1:25 p.m.-1:45 p.m. To get involved, please contact Mr. Burnham at mburnhma@wccusd.net or call the school office. The next English Learner Advisory Committee (ELAC) meeting will be held on Thursday, April 25, 2013 at 4 pm in room # 7. We will talk about the CST. You may ask Mr. Burnham questions. We also invite ELAC parents to a potluck meal for the meeting in May. Thank you for all the parents who agreed to coordinate the Teacher Treat Day next year! 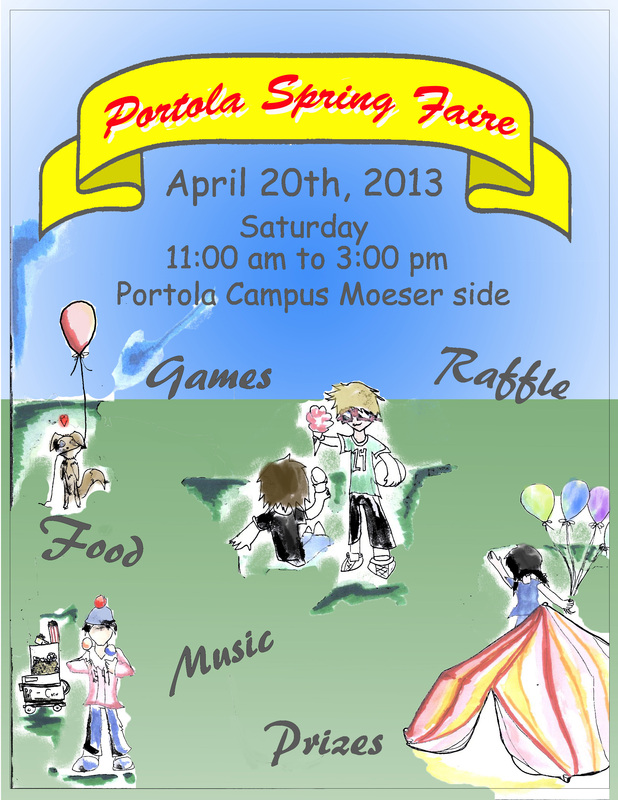 You’re invited to Portola’s 2nd Annual Spring Faire next Saturday April 20th. Admission is FREE! Raffle prizes included gift certificate for a class at the Crucible, spring season tickets to concerts at the Jazz School, and more! Cake walk and other fun carnival games with prizes. See you there! Thanks to all the volunteers for supporting the recent PTSA fundraiser at Golden Gate Fields. Volunteers included Meg McHugh, Pamela Gilbert-Snyder, Matt Willis, Tre Curran, Romy Douglas, Mike S., Mary Schmida, Mike Gest, Nancy Donovan, Yvonne Noble, James Phalen, Lee Hamilton, Nick Adranly and Leslie Reckler. Thank you to RulaAdranly for helping to coordinate this fundraiser. Congratulations to Portola’s Battle of the Books team, which finished in a tie for second in competition against the other middle schools from WCCUSD. The team consisted of Mohamed Arsalan, Raqeeb Chang, Marcelo Monsalve, Joonun Park and Isaac Sloan. Thanks to Portola librarian Ms. Bogie for supporting the team. We need a few volunteers to help coordinate Teacher Treat Day. During Teacher Treat Day, which is held once a month, families provide food for teachers and staff to enjoy during their lunch break. Coordinating Teacher Treat Day is straightforward and we are fortunate to have a generous community that comes together month after month to show their gratitude to the hardworking Portola teachers/staff. If you would be willing to help, please let Tre know at trecurran88@gmail.com. You will receive lots of support and info to make this an easy, enjoyable way to add to a positive school culture. If you missed your chance at ordering the 8th grade Hoodie, here’s your chance! Sign ups are in the school office or email to emireland@yahoo.com with your name, size (s,m,l, xl) and phone number. Re-orders will be done only if there are 20 new orders. You will be contacted with payment information if re-order will be done. Last day to re-order is April 26th. No extras will be ordered. PTSA will meet at 7:00 pm. 8th grade parents will meet at 8:00. Band parents will NOT meet this April, but will meet Tuesday May 14th. -nominations for the 2013-2014 Portola PTSA Executive Board. Hope to see some 6th grade parents at this meeting as this meeting affects you! Mr. Burnham tweets! Follow Mr. Burnham on Twitter @bhambytes. His tweets will also appear o in the column on the right side of the Portola News site. Thanks to the Spanish 3 class, Portola News is now in Spanish! Check it out. Click on Spanish Portola News for the El Toro Weekly, and other Portola News pages in Spanish. The class also translates the El Toro Weekly for the PTSA. Thanks for organizing, Ms. Baldwin! Great concert last night at the 1st Annual District Jazz Festival. Helms Middle, Pinole Valley Middle, Portola, Pinole Valley High, and El Cerrito High put on a good show. Good job band students and music directors! Students are invited to attend the Portola Dance Party at the Arlington Café at 269 Arlington Ave. in Kensington, on Saturday, April 20, from 7 p.m.-9:30 p.m. Tickets are $20, please pay by check made out to Portola PTSA. The venue can accommodate up to 30 students and the entry ticket include sodas, finger foods and desserts. For more information, contact Trish McDermott at trishmcdermott@ix.netcom.com. Congratulations to Julia Walker for placing 2nd at the Bay Area Science Fair, and Erich Fenczik-Warnock for receiving a Special Recognition Award. Golden Gate Fields fundraiser on April 7: We could use two more volunteers to help man the concession stand from 12pm-4:30pm. This is a fun and easy way to raise money by serving hot dogs, beer and sodas. If you can help, please email Rula Adranly at radranly@quest-world.com or call 237-6049. Band parents are also needed to man the other concession stand from 11:30am-4:30pm. Shifts may be split so any amount of time you can spare will be welcome. Please contact Julie Yamashita at jag1999@yahoo.com to help at the band concession stand. Spring Faire is scheduled for Saturday, April 20, and features games, crafts, food, music and other fun carnival-type activities. We need your help to organize the event and also to volunteer on the day of the Spring Faire– please contact Evangeline Ireland at emireland@yahoo.com to get involved. We need a few volunteers to help coordinate Teacher Treat Day. During Teacher Treat Day, which is held once a month, families provide food for teachers and staff to enjoy during their lunch break. Coordinating Teacher Treat Day is straightforward and we are fortunate to have a generous community that comes together month after month to show their gratitude to the hardworking Portola teachers/staff. If you would be willing to help, please let Tre know at trecurran88@gmail.com. Harding Elementary free Used Bicycle Sale and Bicycle Festival is set for Saturday, May 11, from 10am to 1 pm. If you have a bike to donate, please contact zavestoski@gmail.com. Any bikes welcome except rusty or frame damaged bikes. Reception will be Friday, April 18 from 5:30pm-7:30 pm. Portola’s third quarter is now scheduled to end on Friday, March 29, one week later than previously announced. Please check PowerSchool to make sure there are no missing assignments which may affect final grades. Thanks to everyone who supported the cookie dough fundraiser. Please remember to have your order picked up at the end of the school day on Tuesday, March 26, in Room 7. Students are welcome to join the Portola Track Team. 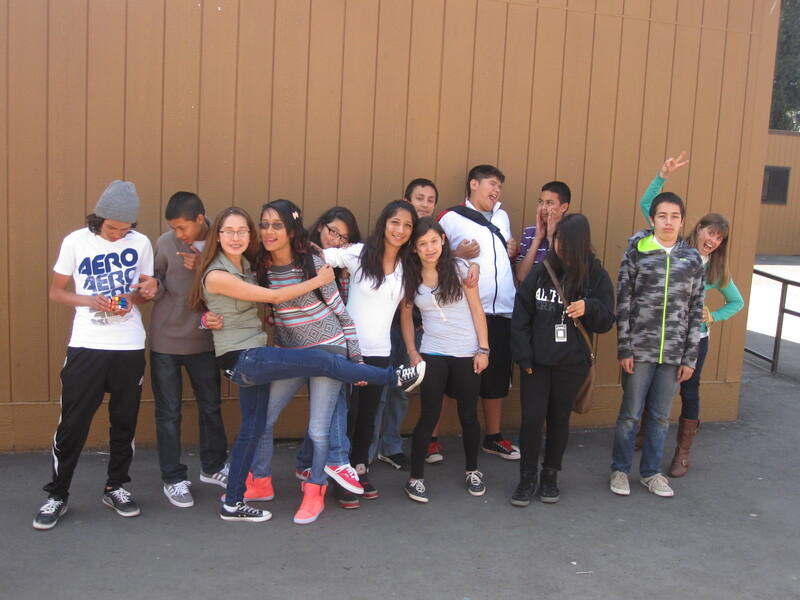 Meet on Mondays and Thursdays at 2:35 p.m. in Ms. Baldwin’s room. A reminder that school will be closed for Spring Break from April 1-April 5. PE: Help is needed for supervision while students are changing clothes for PE. Volunteers are needed to supervise students who have already finished dressing and gone outside, so that the teacher can be free to supervise inside the locker room. The need for help is greatest between 12:30 p.m.-12:50 p.m. and 1:25 p.m.-1:45 p.m. To get involved, please contact Mr. Burnham at mburnhma@wccusd.net or call the school office. Portola’s third quarter is scheduled to end on Friday, March 22. Please check PowerSchool to make sure there are no missing assignments which may affect final grades. Female students at Portola are scheduled to attend the Expanding Your Horizons conference at Contra Costa College on Friday, March 15. The program is designed to motivate young women in science and mathematics. It features hands-on science, technology, engineering and mathematics activities led by professional women scientists and engineers. Spring Faire is Coming Up! Thanks to students in Mr. Kunz’s 6th and 7th period classes for helping to plant trees at Cerrito Vista Park. Students planning to submit science fair projects for the Bay Area Science Fair should please turn in their projects to Mr. Kunz by Monday, March 18. The Bay Area Science Fair is scheduled for Thursday, March 21.